On Thursday 8th November 2018, the Cabinet Secretary Kirsty Williams visited our school and attended a ceremony to officially open our school. This was a ceremony for the pupils and for organisations who had played a part in the development and construction of the new school building. 450 of our pupils and students were selected to attend. The top 50 pupils in each year group who had the highest number of house points were invited to form the audience. The Show Choir and ensemble gave an outstanding performance of Karl Jenkins' Adiemus which brought many a tear to many of the guests' eyes! 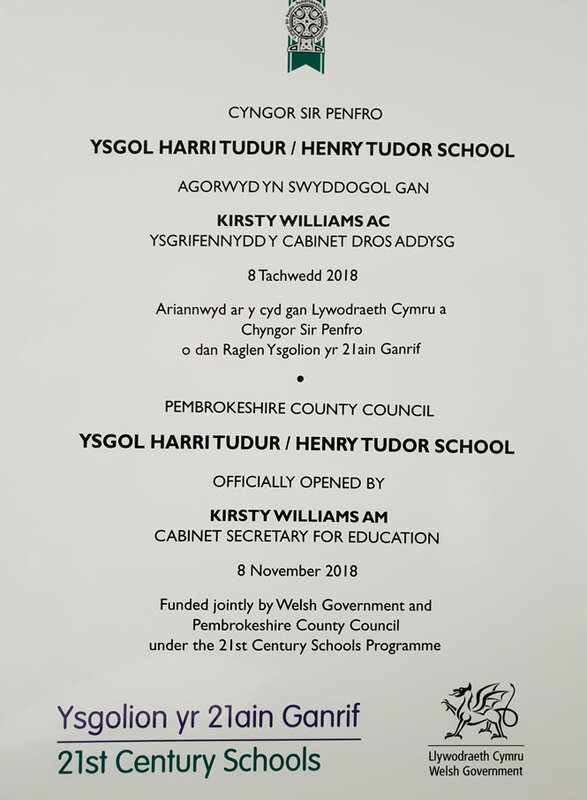 The Minister said: “I am absolutely delighted to open Ysgol Harri Tudur today – a £38.3 million project, jointly funded by Pembrokeshire County Council and Welsh Government through our 21st Century Schools Programme. Mrs Williams then invited a Year 10 pupil to help her unveil the plaque to commemorate the opening. Ysgol Harri Tudur / Henry Tudor School was delighted to welcome the chairman of Pembrokeshire County Council, Councillor Aden Brinn, also the Chief Executive of Pembrokeshire County Council, Mr Ian Westley, the Cabinet member for Education, Councillor David Lloyd, and Councillor Bob Kilminster, the Cabinet Member for Finance and member with responsibility for the 21st Century schools programme. Our School Governors and guests and friends of the school were in attendance. It was an absolutely beautiful celebration and opening ceremony. The Minister then went on a short tour of the school whilst the invited pupils and students enjoyed a celebratory treat in the Refectory.